The Chancay culture inhabited the central coast region of Peru, centering its activities in the Chancay and Chillón valleys but also occupying the Rimac Valley and the Lurín area. This is a desert region, but its fertile valleys form resource-rich river oases. The Chancay had an agricultural economy supported by the construction of irrigation canals and reservoirs. These people also engaged in fishing and regional trade, journeying overland to the Amazon rainforest and Andean highlands and by sea north and south along the Pacific coast. 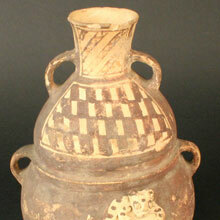 The ceramic and textile goods they manufactured were plentiful and homogenous, suggesting mass production. 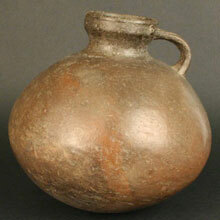 The Chancay people also made domestic and ceremonial items from metals and wood. Artistically, the Chancay culture is best known for its ceramics, textiles, and woodwork. 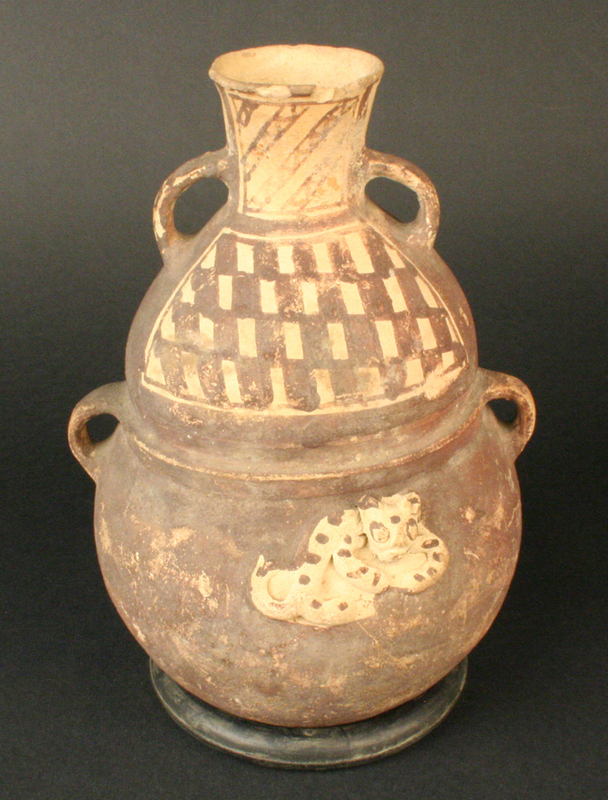 The most common ceramic vessels they made are oblong jars with narrow necks and wide mouths, with modeled human faces and geometric designs painted in black on a cream-white background. 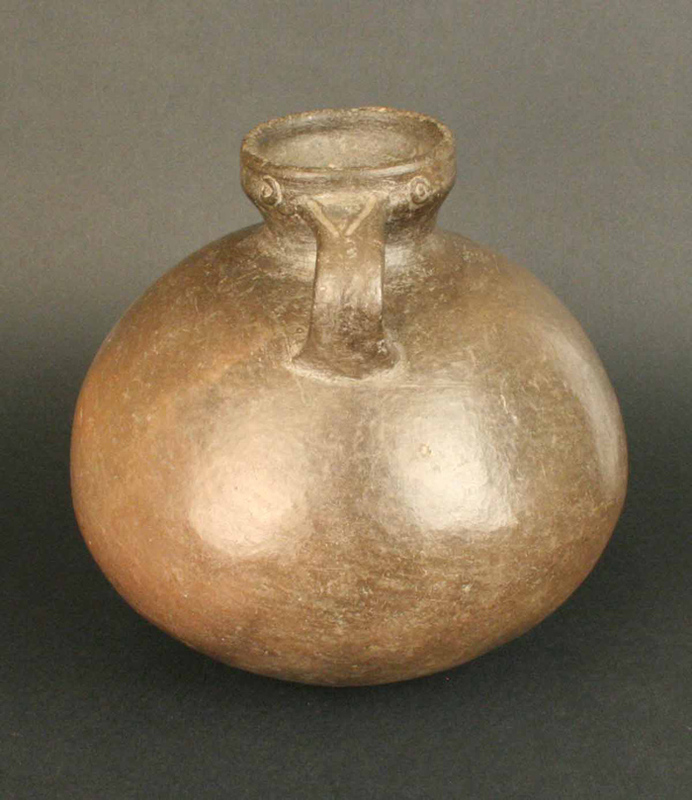 Other commonly found Chancay vessels are shaped like animals such as birds or llamas. They also made female figurines with short arms and eyes accentuated with a line on each side. The range of techniques, colors and themes used to make their textiles is quite remarkable. The Chancay used llama wool, cotton, and feathers, weaving a variety of goods that includes garments, bags, and funeral masks. The techniques they used include decorated open weave, brocade, embroidery, and painting, with the most common designs being marine motifs and geometric patterns. Woodworking produced everyday implements, statues, and decorative items, some of which they painted, while their metalwork – mainly using silver – produced clothing adornments, decorative ornaments, and masks. Unlike many other Andean groups, the Chancay used a simple style that reflected their everyday lives and certain aspects of religious life. It is believed that the Chancay comprised a significant kingdom that included the domains of a number of local chieftains in the valleys and coastal regions of central Peru. Their basic form of organization was based on the ayllu, a small kinship-based clan controlled by a kuraka or ethnic leader, who would oversee the work of skilled workers, craftspeople, farmers, and herders, as well as playing an official role in festivals. Chancay society was highly stratified, as the difference in grave goods accompanying different individuals shows. The Chancay built large cemeteries to house their dead, although they buried them in different ways. The tombs of leaders and people of rank were rectangular or quadrangular chambers with roofs of sticks and mud, 2 to 3 meters (up to 10 feet) deep, and accessed by a ladder. These tombs brimmed with offerings of ceramics, textiles, and artifacts made of precious metals. The graves of ordinary people were much shallower and contained a bundle with undecorated fabric and just a few grave goods. The Chancay built different kinds of settlements, from basic settlements to major urban centers with civic-religious buildings and residential palace complexes. However, all of these sites have differently allocated social spaces and cemeteries relatively nearby. Molded adobe bricks, sometimes combined with stones, were the most common building material. The Chancay also built pyramids that were shaped like mounds with access ramps. The large size of their main urban centers may be linked to the mass production of goods. The Chancay culture arose following the dissolution of the Wari Empire. The Chancay’s intense interregional trading brought them into contact with a number of other states and chiefdoms over a wide area. In the fifteenth century the Chancay were subsumed into the Inka Empire. Intermedio Tardío 1100- 1470 d.C.